During the summer, I tend to eat a lot more salads than I do during other times of the year. Veggies are fresher and tastier (and, if I’m lucky, some are even home-grown) and it’s usually hot enough that I don’t feel like cooking hot foods – let alone like eating them. Cold salads are refreshing, as well as tasty, and they’re just ideal for hot weather in my book. One thing that I will bake, no matter how hot it is, is a batch of homemade croutons to accessorize my salads. They add a lot of flavor and a great crunchy texture. I also appreciate the fact that they will use up a leftover loaf of bread, since loaves don’t seem to keep as well in the summer as they do during the cooler months. They’re easy to make. All you need to start off is a loaf of your favorite bread. I often opt for french bread or sourdough, unless I have something homemade on hand that needs to be used up. I slice the bread and rub each piece with a cut clove of garlic, then spread them on a baking sheet, spritz them with olive oil and sprinkle with salt before baking until crisp. If you like really buttery croutons, or want to add additional spices and can use the extra sticking power, you can brush your bread directly with melted butter or olive oil. I find that they crisp up well with just a spritz or two (I have an olive oil mister). You can cut off the crusts before cubing the bread if you find that they get too hard for your tastes when the crust bakes. Personally, I always leave them on, both for the texture and the rustic look. 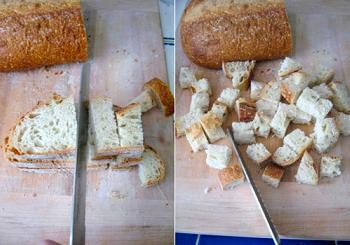 Slice the french bread into slices no more than 1/2-inch thick. Rub each slice with the cut side of your garlic. (Brush lightly with butter, if desired). Cut the bread into cubes and place in a single layer on prepared baking sheet. Spritz with olive oil if you have not yet rubbed the bread with butter or oil. Sprinkle with salt. 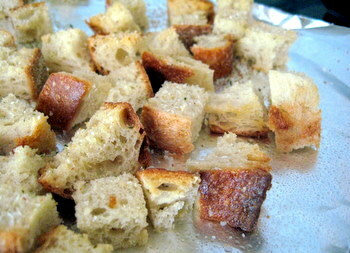 Bake for about 15 minutes, or until croutons are crisp and lightly browned. If croutons are not browning evenly on all sides, turn over after 10 minutes. Cool on baking sheet before adding to a salad. I love homemade croutons. These look good. I like eating lots of salad during the summer too. I like to make it interesting by adding different fruits, veggies, nuts and croutons. Sometimes I add so many croutons, that it turns into a panzanella. Homemade croutons are SOOOOO much better than store bought ones, aren’t they? I always look for the reduced price bread at the store and make a bunch.